Purchased by Pierpont Morgan, 1896. Printed in type 1:140G. In 2 columns of 42 lines. Collation: Vol. I: [A1] 1-9¹⁰ 10¹⁰(+8*: et aurum); [A2] 11-12¹⁰ 13⁶(+4*: noluerunt); [B1] 14-24¹⁰; [B2] 25¹⁰(+7*: eliasib) 26¹⁰(+9*: oriente); [B3] 27-32¹⁰ 334: 324 leaves. Vol. II: [C1] 1-13¹⁰; [C2] 14-15¹⁰ 16¹⁰(+10*: In quo polluimus); [D1] 17-26¹⁰; [D2] 27¹²; [D3] 28¹⁰ (+7*: enim cristi); [D4] 29-30¹⁰ 31⁴(+3*: nobiscum); [D5] 32¹⁰: 319 leaves, leaves /9-10 blank, + π4 (rubrication guide). 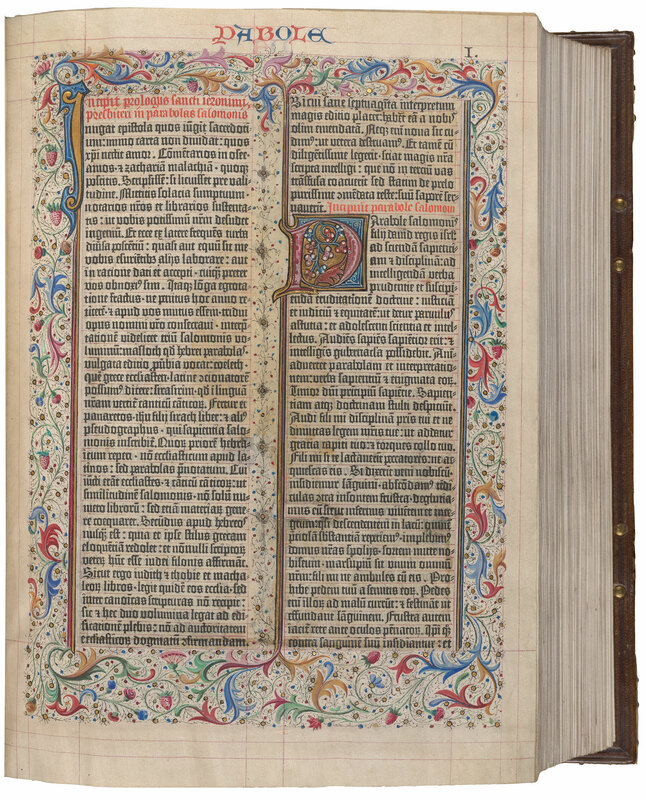 Sheets were seen by Aeneas Sylvius Piccolomini some time before his letter of 12 March 1455 to Cardinal Juan de Carvajal, which was printed in Aeneas Sylvius Piccolomini, later Pius II, Pont. Max. Epistolae saeculares et pontificales. [Cologne : Arnold Ther Hoernen, ca. 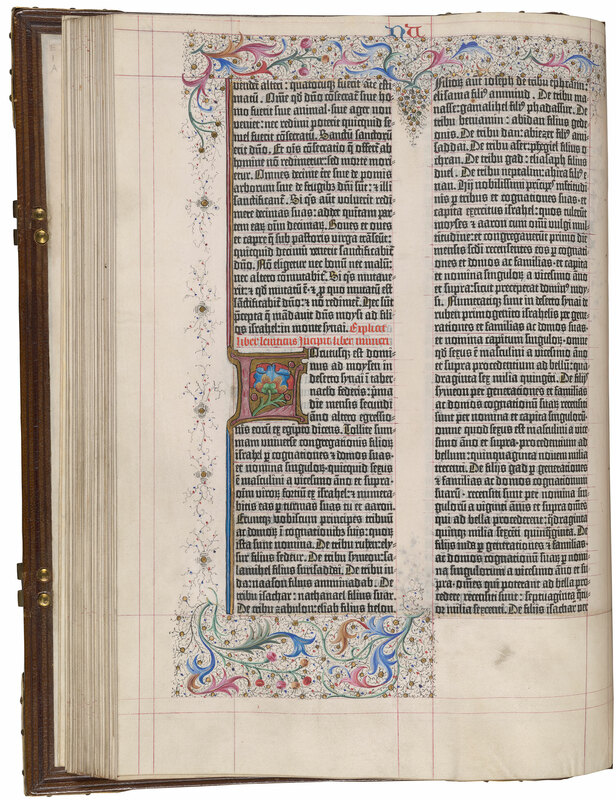 1480; (ISTC ip00726500)], leaves p7v-q5v (with mention of the Bible on leaf q1 verso): see Meuthen 1982, and Davies 1996, pp. 193-201, with plate. Copies at München BSB and Vienna ÖNB have a printed rubrication guide in four leaves, π4. PML copy printed on vellum. PML copy Setting A: I, ; I, /1-4 and 7-10; II, /1r and Setting B: I, /5.6; I, ; I, /1r-2r; I, [14-16]; II, [1-2]. PML copy leaf dimensions: vol. I: 40.8 x 30 cm., II: 40.4 x 29 cm. PML copy lacks 6 entire leaves (vol. I, /1, /5, and /3 and vol. II, /8, /12, and /4) and 2 partial leaves (I, /9, first 8 lines, and /10, first 17 lines), replaced in pen facsimile by Adam Pilinski, and lacks leaves vol. II, /9-10 (blanks) and rubrication guide (π4). Both volumes: Modern full brown goatskin over wooden boards (42.5 x 33 cm. ), sewn on 6 supports by Francis Bedford. Vellum pastedowns and fly leaves; decorative endbands. 5 modern brass bosses per board and 2 clasps, imitating 15th-century furniture. Hand decoration: Bruges illumination (in the style of Willem Vrelant), foliate borders and initials by at least 2 different hands, ca. 1460; many initials and some borders replaced by Pilinski. 6 entire leaves, two partial leaves, and marginal sections of 72 other leaves replaced by Adam Pilinski with additional illumination/decoration, 1863-1866: Vol. I, leaves 1 (full facs. ), 5 (full facs. ), 29, 49, 61, 63, 84, 102, 114, 120-25 (margins), 129, 147, 160, 177 (partial facs. ), 193, 208, 226, 231, 239, 247, 260 (partial facs. ), 261, 266, 273, 280, 293 (full facs. ), 297, 300, 303, 307, 311, 314, 321, 323; Vol. II, 1, 11, 70, 99, 102, 145, 149, 154, 160, 189 (full facs. ), 190, 195 (margin), 202 (margin), 235, 242, 249, 262, 263 (margin), 266, 268, 270, 272, 273 (full facs. ), 274, 275, 276, 277, 279, 280, 285, 293-95 (margins), 303, 304 (margin), 305, 306, 308, 309 (full facs. ), 311 (margin)). Pilinski tried to blend his decoration into the original, but the style of painting differs enough to recognize his additions, even on original vellum; he also added decoration along the edges of his vellum patches to hide the joint/glue line. Annotations: Several marginal notations (I, /2r and 6r), one rubric (II, /7r), and foliation in a roman script (perhaps a Spanish hand? ), 17th century. Marginal notation: "aquí" (vol. I, /4r (f. 105r)), early/perhaps 16th century. Illuminated in Bruges, ca. 1460; unidentified Spanish institution/library (see marginal notations in copy and letter from Henry James Tufton in dept. files); Fidelis Butsch, bookseller in Augsburg, 1859; Edwin Tross, bookseller in Paris, 1863; Sir Richard Tufton, 1st Baronet (1813-1871), purchased from Tross via Quaritch, 1863 and had it repaired/restored by Pilinski and rebound by Bedford; inherited by his son: Sir Henry James Tufton, Baron Hothfield (1844-1926), who consigned it to Sotheran & Co., May 1896; Pierpont Morgan, purchased 16 June 1896.